Danish Government would continue to support Viet Nam in its national development on the basis of the Denmark-Viet Nam Cooperation Development Strategy for the 2006-2010 period, affirmed Deputy Prime Minister Bendt Bendtsen during his talks with the Vietnamese permanent Deputy Prime Minister Nguyen Sinh Hung in Ha Noi on Sept. 11. 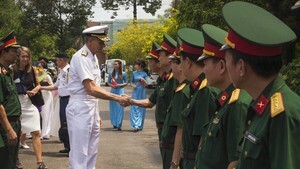 Between 2006-2010, Denmark's aid projects and programmes for Viet Nam would give priority to trade, investment, agriculture, fisheries, environment and administrative reform, with special attention placed on socio-economic development and poverty reduction for remote areas, Deputy PM Bendt Bendtsen noted. Deputy PM Bendt Bendtsen led a Danish Government delegation on an official visit to Viet Nam from Sept. 11-15, and was accompanied by representatives from 21 major Danish enterprises. During the talks, the two sides said they were pleased with the development of the two countries' relations over the past 35 years in various fields including politics, economy, commerce, investment and culture. The two Deputy PMs expressed their determination to promote and expand stable and sustainable cooperation. Deputy PM Hung expressed gratitude for the Danish Government and people's valuable assistance to Viet Nam, particularly in its current renovation process. Danish aid projects and assistance programmes for Viet Nam in fisheries, environmental protection, administrative and legal reform, agriculture and rural development, poverty reduction and transport had produced practical results, helping Viet Nam overcome difficulties, obtain achievements in socio-economic development, Deputy PM Hung said. He stressed the directions and practical measures needed to promote and expand cooperation between the two countries in a number of areas, particularly economic, commercial and investment cooperation to increase the value of trade and Denmark's total direct investment in Viet Nam to more than US$1 billion. Deputy PM Bendt Bendtsen affirmed that Viet Nam was an important partner for Denmark in Asia, adding that Denmark supported Viet Nam's bid to become a WTO member and a non-permanent member of the UN Security Council in the 2008-2009 term. Danish businesses sector appreciated the investment opportunities and environment provided by in Viet Nam and said that they would consider to investing in Viet Nam's infrastructure construction, sea ports, cement, construction materials, food processing and soft drinks production.